Profile: Tony Hiller began his musical career as one half of The Hiller Brothers with his brother Irving. They appeared with such artists as Alma Cogan, Tommy Cooper, Val Doonican, Matt Monro, The Shadows, Bernard Manning, Kathy Kirby, Roger Whittaker, Rip Taylor, Gene Vincent, Lance Percival, Tessie Oshea, Frank Ifield, Deep River Boys, Dallas Boys, Clark Brothers, Paul Melba and Ray Burns. The Artist: Over 500 artists have recorded Tonys songs, including Elton John, Duke Ellington, Olivia Newton John, Cliff Richard, Lulu, Andy Williams, Ray Stevens, The Hollies, The Shadows, Sonny & Cher, The Miracles, The Osmonds, The Fortunes, Al Martino, Glen Campbell, Lou Rawls, Fredda Payne, Ann Murray, Bobby Vinton, The Guess Who, Daniel Odonnell, Crystal Gayle, Brotherhood Of Man, Frankie Vaughan, Freddy McGregor & Marcia, Byron Hill, Matt Monro, Dickie Valentine, The Drifters, Kenny Rogers & First Edition, Barbara McNair, Steinar Albrigtsen, Donnie Elbert, Joe South, Shaun Cassidy, Clodagh Rodgers, Tony Christie, Dorsey Burnnette, Shanana, Love Generation, Kenny Lynch, The Flying Machine, Joe Brown, Ann Marie David, Mary Roos, Raphael, Sheila, T.C. Taylor, Joe Dolan, Benny Mardones & Teresa James, Georgie Fame, Alan Price, Sarah Jory, Shelly Laine, Caroline Hall, Alison Clements, Wade White, John McCabe, Mary Duff, Mrs Mills, Fabrizia Vannucci, Cleo Laine, Malcolm Roberts, Mike & Bernie Winters, Monty Norman, Dominic Kirwan, Johnny Hallyday, Sacha Distel, Barbara Dickson, Peters & Lee, Johnny Ray, Arthur Mullard & Hylda Baker, Clive Dunn, Noele Gordon, Gil Grand, Sonia, Sinitta, The Nolans, White Plains, Edison Lighthouse, Tony Burrows, Solomon King, Ed Bruce, Margo Smith, Six, Roger Cook, The Big Three, Everton FC, Chelsea FC, Manchester United FC, Liverpool FC, Crystal Place FC, Scotland World Cup Squad 1986, Tony Hiller Orchestra, James Last Orchestra, King Singers, Scott Fitzgerald & Yvonne Keeley, Sweet Dreams, Debbie Nunn, Mike Curb Congregation, Victor Sylvester Orch, Arthur Murray Orch, Ross Davidson, Joe Loss Orch, David Rose Orch, Johnnie Johnson & the Band Wagon, Joe Henderson, Pipkins, Wee Willie Harris, Shaun Dunphy, Keith Potger, Union Express, Robby, Rex Gildo, Big 3, Gigiola Cinqueti, Gina and the Champions, Freddie Starr, Nicky Thomas, Carnaby Street Set, Phil Kesall, Colin Peterson, The Orchids, The Montanas, Vaudaville Express, Johnny Gentle, Mirror, Ric Price, Lovin' Feeling, Rubic, Royalty, Colin Heywood, Genny & the Big Guys, The Countrymen, The Jordans, Silhue Jos Mulle, Phil Conway & the Free Group, Allan Crawford Orchestra, Nils Dacke, Nils Tibor, Les Humphries Singers, Jean Clauderic, Jordi Hansruedi, Goldie, The Chapta, Bob and Carol Jean Thomas, David & Rozza, Larry Green, Earl Wilson Junior. The Producer: As a record producer Tony has recorded over 95 different artists including, Andy Williams, Johnnie Ray, Brotherhood Of Man, Guess Who, Peter & Lee, Harry Secombe, Moira Anderson, Guys n Dolls, The Casuals, Sinitta, Joe Henderson, Johnny Goodison, New Faces, Su Schifin, Diane Soloman, The Chants, One and One (Greenaway, Burrows), Sue and Sunny, Martin Lee, Lee Sheriden, Hoagy Pogey, Noele Gordon, Clive Dunn, Sacha Distel, Jess Conrad, Byron Hill, Wild Fantasy, Arthur Mullard, Eastenders TV cast LP, The Royal Philharmonic Orchestra, Rubik, Vaudaville Express, Rickard Brothers, Russell Stone, The England World Cup Football Squad, Scotland World Cup Squad, Everton FC, Manchester United FC, Liverpool FC, Crystal Palace FC, Chelsea FC. Sinitta, Keny Lynch, Mirror, Ric Price, Lovin' Feeling, Rubic, Colin Heywood, Bob and Carol Jean Thomas. Record Labels: Tony has produced records for the folowing Labels: EMI, Columbia, Decca, RCA, London, PYE, Philips, CBS, Deram, Dawn, Polydor, Fontana, Parlophone, Piccadilly, Magnet, Midland, MAM, Direction, Ronco, Page One, Bradleys, BR Music, BBC Records, K Tel, Pickwick, Warner Brothers, Warwick, Castle Communications, Hyde Park Music. The Songwriter: In his Songwriting career, Tony has written or co written over 1,400 songs, of which 32 singles have charted world wide. His Eurovision Song Contest winner "Save Your Kisses For Me" was number one in 27 countries, and sold 5 million singles. The number ones include "Angelo", "Figaro" and "United We Stand". 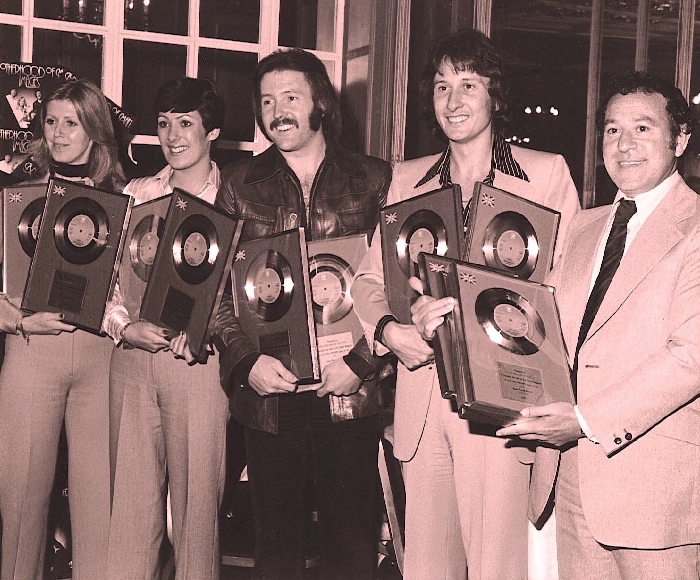 Other songs that have charted include "Reach Out Your Hand", "Where Are You Going To My Love", "Lady", "Kiss Me Kiss Your Baby", "My Sweet Rosalie", "Oh Boy (The Mood Im In)", "Highway Man", "Beautiful Lover", "Middle Of The Night", "Lighting Flash" all by The Brotherhood Of Man, "Sunny Honey Girl" by Cliff Richard, "Only Fools (Never Fall In Love)" by Sonia, "Put A LIght In Your Window" by Tony Christie, "Here We Go" by Everton FC, "No One Can Stop Us Now" by Chelsea FC, "Manchester United" by Manchester United FC, "Where Eagles Fly" by Cystal Palace FC, "Sitting On Top Of The World" by Liverpool FC, "Nights" by Ed Bruce, "Save Your Kisses For Me" by Margo Smith and also by Bobby Vinton, "Weve Got the Whole World At Our Feet" by the England World Cup Squad, "Daddy Loves You" by Dorsey Burnette, "Spilled Perfume" by Gil Grand, "United We Stand" by Six.